Think back to your favorite teacher in school. Wasn’t that the one who made the subject matter interesting and made you always want to know more? For one local woman, Tricia Martineau Wagner, that’s her focus – her job, if you want to call it that – to open up the history books and make the stories come alive for students. What better way to learn about history than to see it up close and personal. 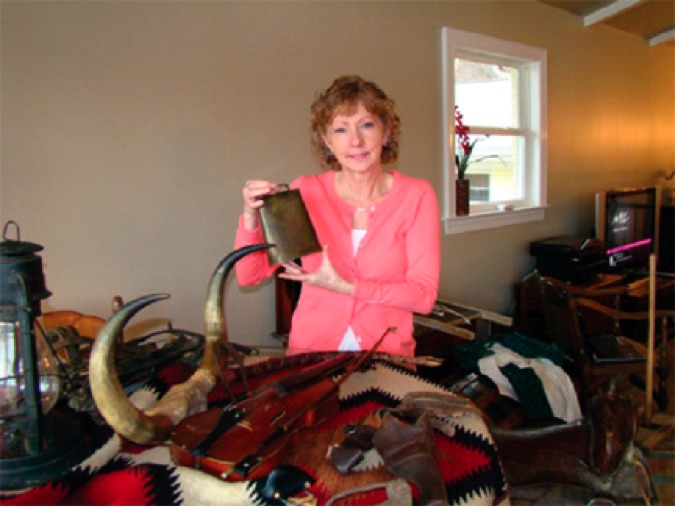 Area students now have an opportunity to do just that with the woman who is a sort of traveling history museum. From a real saddle of the old west to a trunk similar to ones slaves hid in to escape to freedom in the Underground Railroad, Wagner brings history to life in a classroom, not only with props but with interesting stories about people from the past. Tricia gave up her life of teaching second and third graders when she wrote her first book. She now loves to travel around to schools and present her history lessons geared toward grades 2-8. And the kids love them too because they aren’t the typical lessons as much as they are dramatizations and demonstrations. Tricia dresses in period costumes of the old Oregon Trail pioneer. Her stories include a time period from the early pioneers and their hardships to slaves who were part of the Underground Railroad. She has traveled across the country delivering her messages that is included in four historical, non-fiction books written in short story form. “Historical non-fiction that reads like fiction,” someone commented about her books. And Tricia says was the best compliment received on her work. Tricia researches then writes books and gives programs to school children on what she has uncovered from the past. They may be about unknown characters in history but they are an important part of that time. “Fascinating” is the word that describes what she presents in her programs because she enthusiastically tells a story – brings the world of this period of history to life. In this “electronic, computerized age,” she shows the kids how women washed their clothes, made butter, what a branding iron looks like with the props she brings along to her programs. It’s not just a lesson you read about, but a lesson you can touch, feel, and experience. Tricia, who now lives in Denver with her husband and Brittany Spaniel dog, relates how she got started writing historic manuscripts. “Mark and I were moving with our two kids years ago. We were running late to get to the plane.” She described the travel as a frantic, difficult inconvenience. Then she said as she settled down and looked out the window of the airplane at the mountains she wondered why she was complaining. That’s when she thought of the hardships pioneers went through. “I thought at least I’m not in a covered wagon,” she recalls. That resulted in her first book – “It Happened on the Oregon Trail.” Her next book, “African American Women of the Old West” followed because she said it was tough to find information about black people from the 1840s to 1860s. “I like to show the kids an old trunk that a slave might hide in to get to freedom. I let them climb in and see what it was like,” she said. “It’s amazing to me when I start talking about this part of history, the number of kids who think there were no black cowboys,” she said. “The black cowboys made up one-fourth of the wranglers and rodeo riders. This book tells their story,” states the promo on the book. But she finds the pioneers equally fascinating. Research of travel on the Oregon Trail led to a connection she made with descendants of Rebecca Winters who died in Nebraska on the trail in the mid-1800s. But probably the best thing about Tricia is her enthusiasm that transcends to whatever she does – whether it’s writing or bringing history to life with her presentations. What a great opportunity for kids of all ages to learn what history really is all about. She also conducts teacher in-services and staff development meetings for school districts interested in integrating literacy in their Social Studies curriculum to further expand her history programs to other teachers. “The textbooks seemed so dry. Making the story interesting…and in a fresh manner was important,” she added about her work.